Ivana Capan, Tomislav Brodar, Jose Coutinho, Takeshi Ohshima, Vladimir Markevich, Anthony Peaker, Acceptor levels of the carbon vacancy in 4H-SiC: combining Laplace deep level transient spectroscopy with density functional modeling, Journal of Applied Physics 124 (2018) 245701. We proudly present young scientists working on the e-SiCure project. 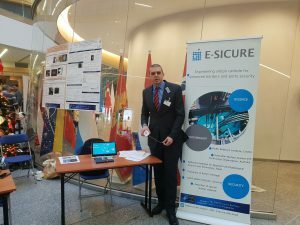 A special event was held at NATO Headquarters in Brussels on 29 November 2018 to celebrate the 60th anniversary of the NATO SPS Programme. Our detector prototype has been presented to NATO officials.